We are living through a very significant historical change: the collapse of the historic churches which have shaped British society and culture. The Church of England, by law established, is no exception. A survey I recently carried out with YouGov for the Westminster Faith Debates (June 2013) shows tha in Great Britain as a whole only 11% of young people in their twenties now call themselves CofE or Anglican, compared to nearer half of over-70s. The challenge facing the new Archbishop of Canterbury, Justin Welby, is to address this decline. But the initial indications suggest he may be heading in the wrong direction. Consider the Archbishop’s recent criticisms of Wonga and other payday loan providers. Most commentators were positive. Welby braved the revelation that the Church had a small investment in Wonga, took advantage of the media coverage, and managed to highlight an important issue. This is remarkable given that he didn’t have any serious initiative to announce for the Church doesn’t have the wherewithal to set up the credit unions of which he spoke so favourably. Here, it seems, is a churchman with something to say, the ability to say it in a comprehensible fashion, and the courage to stand up for social justice. So what’s the problem? Providing care for the poorest in society was, historically, part of the Church’s business. In the mid-twentieth century it happily joined forces with the state to nationalise this work. When the Thatcher government started to challenge the welfare consensus, the Church of England was quick to leap to the defence of the poor. Its 1985 report Faith in the City greatly irritated Mrs Thatcher, just as Mrs Thatcher’s ‘Sermon on the Mound’ greatly irritated the clergy. I was near the heart of all this, straight out of university to my first job teaching in an Anglican theological college (seminary). In the wake of Faith in the City it had been decreed that the students should be bundled off to “urban priority areas” to “get alongside the poor,” and win their clerical spurs. Despite good intentions, I found the whole thing patronising and economically naïve. Quite a lot of “the poor” didn’t seem to want to be got alongside. There was also a very obvious set of gender biases; the ideas were still of male clergy supporting working-class men. And the underpinning thinking was long on wealth distribution, short on wealth creation. Fast forward to the last Archbishop, Rowan Williams, a self-confessed “beardy leftie.” Under his benevolent rule, the Church’s focus on the poor and social justice remained remarkably similar to that of the 1980s, despite the fact that the category of “the poor” had by this time become highly problematic. So when Rowan William’s successor immediately turned his attention to ‘the poorest in society’, I heard the same old record going round. The stuck-ness is concerning. What’s worse is that this set of priorities is now strikingly out of step with the views of a majority of Anglicans, not to mention a majority of the British people. My YouGov poll finds that, even after correcting for age, most Anglicans fall on the ‘free market’ (in favour of individual enterprise) rather than the ‘social welfare’ (in favour of welfare and state interventions) side of the political-values scale. Indeed, Anglicans are more tilted in that direction than the general population of the UK, even though the latter is also tilted towards ‘free market’ values. For example, just under half of all Anglicans, churchgoing or not, think that Mrs Thatcher did more good for Britain than Tony Blair, compared with 38% of the general population (16% of Anglicans think Tony Blair did more good, compared with 18% of the general population). And nearly 70% of Anglicans believe that the welfare system has created a culture of dependency, which is almost 10 percentage points more than the general population. Linda Woodhead is Professor of Sociology of Religion at Lancaster University. She co-organises the Westminster Faith Debates (for public debate on religion), which are funded by the ESRC and AHRC, and which supported the YouGov poll cited here. She is the author of Christianity: A Very Short Introduction. Follow @LindaWoodhead on Twitter. Image credits: (1) Photograph of Payday Loans shop, by Seth Anderson; CC-BY-SA 2.0 License via Flickr. 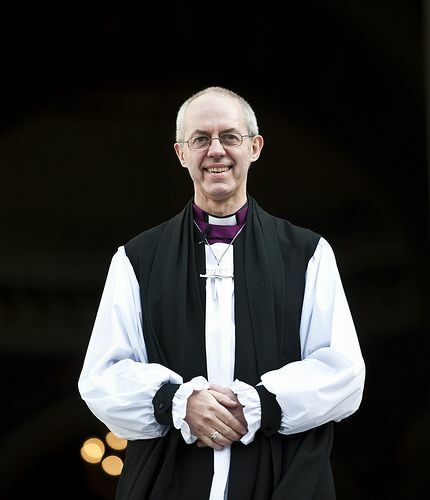 (2) Photograph of Justin Welby, by Catholic Church (England and Wales); CC BY-NC-SA 2.0 License via Flickr. “Since personal morality is the church’s core business in a way welfare provision is not … “: What an absurd assertion, in an otherwise reasonable argument. I enjoyed your thoughtful article. Speaking, however, as one of these rare Anglican young people, I think that Welby is closer to getting at some real issues than you give him credit. I understand that the fights for inclusion were extremely important to your generation, and I am very thankful for the injustices they uncovered. But they’re essentially over. Women’s equality, for almost everyone under 30, is an assumption rather than a live issue. Any inconsistencies are surely going to be sorted out within a few years; it just takes time to reform any large bureaucratic institution. You’re getting that response on your survey because it’s something that’s a bit incongruous with the worldview taught to this generation, and not because it’s something that we’re desperately trying to work out. On the other hand, one of the most serious issues that my generation will face is working out how on earth we’re going to reconcile our relationship with the physical world, put together a decent living in a very different economy from the one our parents worked in, and perhaps even start to undo the damage wrought by the rampant consumerism of the last centuries. Giving people access to financial institutions that won’t take advantage of them is a huge step in this direction, and I would hardly call providing non-discriminatory microloans to the populace patronizing. The larger issue here, though, is something that nobody has really figured out, and nobody wants to talk about it seriously because of the personal implications and the fact that we’ve been taught not to be open with one another about money. Teaching the Christian theology of a redeemed creation is, ultimately, the answer to the world’s problems. I admire the archbishop for starting on the problem in a practical way. Are the Anglians surveyed Christian, or just church goers? Sexism and gay marriages is just not an issue among the majority of the population. It is an issue stoked up by the media to provoke comment and to fill papers and air time. On the other hand a 1000% interest rate is an issue and is imoral because it is ‘helping’ people who can’t afford the help. Tjhe church should press for an upper % interest limit to safeguard those whose education lacks financial acumen.